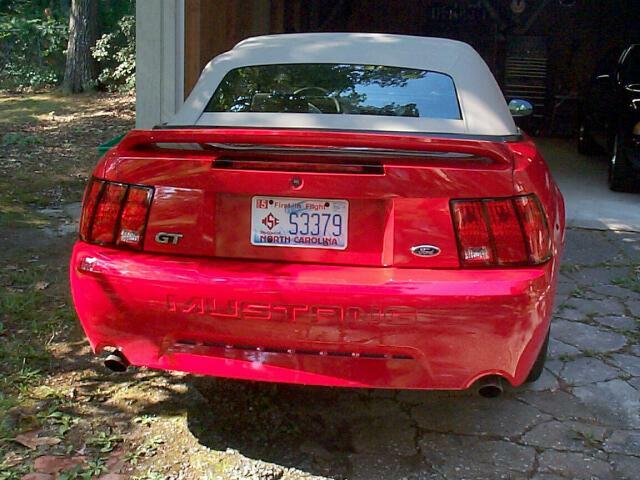 For those who have purchased the newer 1996-2004 Ford Mustang and Ford Mustang GT, you will notice that the rear lights are quite attractive and have considerable potential especially the newer 1999 model. Since each rear lens assembly has three lamps, one quickly notices that there are only two brake/turn signal lamps and the remaining one is only used for a parking light. The inboard rear bulbs are only used for parking lights and can simply be upgraded to dual filament brake/turn signal lights. Once you have three rear brake lights available, this lends itself to another noticeable and exciting upgrade ... sequential turn signals! With the three lights being evenly spaced and the new faceted reflector with clear red lenses makes this a stunning and attractive mod to an already distinguished automobile! I've been recently approached by several new and recent model Mustang owners for assistance in getting a unique and striking sequential rear lighting system installed on their cars. 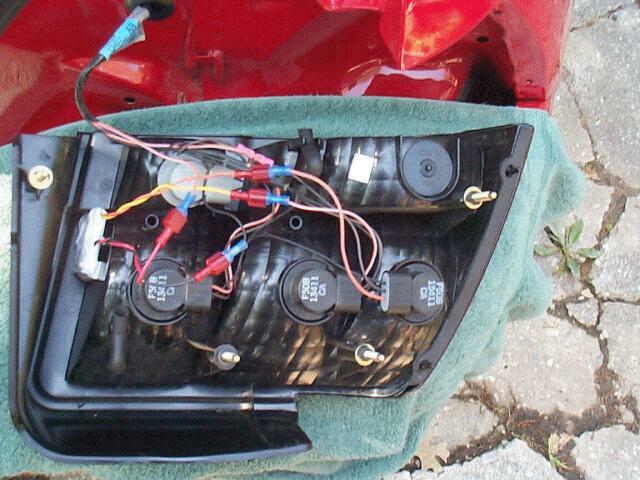 Since I have been building sequential lighting systems for the past few years for GM owners, I am compelled to do the same for the late model Ford mustang owners as well. 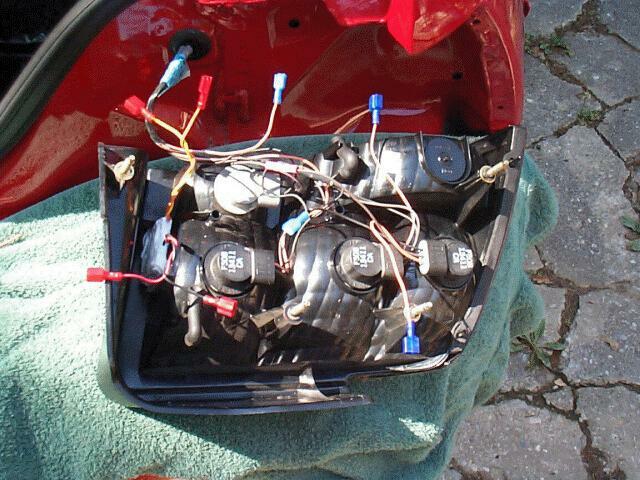 Below is how I can supply those interested with a 'do-it-yourself' sequential lighting system kit. 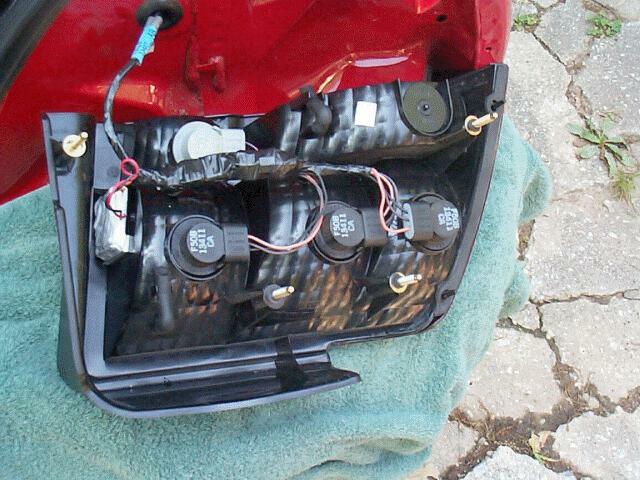 Included is all hardware needed and step-by-step instructions for those who have basic handtools and understand basic automotive lamp wiring.. 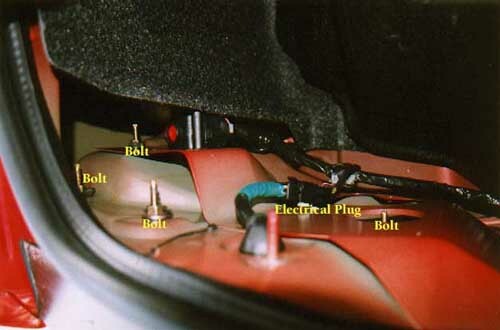 I will document with the following pictures how to install the ATS lighting system on a new 1999 Ford Mustang GT. This new convertible is owned and operated by Michael Davis, a local businessman in the Sanford, NC. area.This new model has some very nice looking rear taillights! They are about to look even better. Using a short 11 MM open end wrench we will remove these four bolts so we can pull the lens assembly out the back of the body and lay it face down on a fluffy towel so as not to scratch the rear bumper. 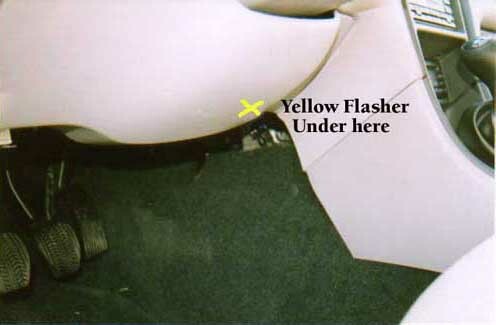 Here we have removed the passenger side lens assembly. You will notice that the inboard socket (grey colored) is a parking light and we will replace this with a brake/turn signal socket just like the other two (color black with white numbers on the back). After cutting a few wires making up the connections as described in the written documentation, this is what install will progress to, a controller module mounted in the inside of the bucket and male/female connectors waiting for the final connections to be made up. Modules are neatly mounted with 3M double-sticky tape into a convenient recessed area to the inside flat on the inboard lens area. The controller connections are "plugged" into the wiring harness with four terminations and we are ready for testing. Now that we have re-wrapped the wiring harness, all looks like factory and we are ready to install the new modified turn signal flasher under the dash shown below. 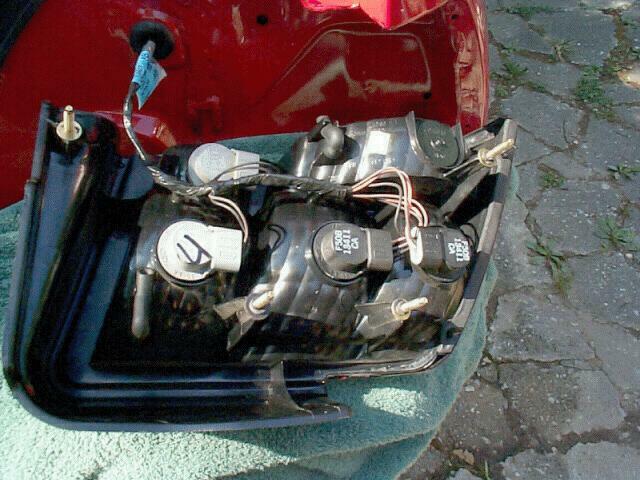 And now we are ready to show off to the other Mustang owners a mod that no one else has! All required hardware is included in this kit, all you need to supply is handtools and labor. CLICK HERE to read the kit inventory and installation instructions! CLICK HERE to select order information! Special thanks to Rusty Harris, Alex Constan and Michael Davis for their support, contributions and Mustangs during the development of the ATS lighting systems kit for late model Mustangs.